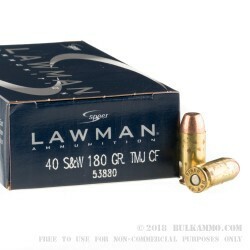 Despite a resurgence in the 9mm Parabellum and the .45 ACP remaining as popular as ever, the .40 S&W remains the top choice for law enforcement agencies in the U.S. Of course this is no accident; the .40 was built for the exact purpose of dominating the law enforcement community which it has done with gusto. 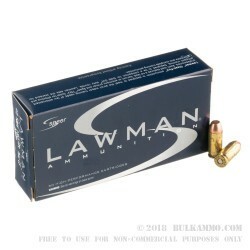 Speer has long been a favorite of the LEO community, the Lawman series being a prominent lineup in their catalog. In order for a lawman to be effective should the need ever arise for deadly force, they must be prepared through practice. We’ve all been to the indoor ranges, though; they’re usually something akin top breathing through a solid lead bar. 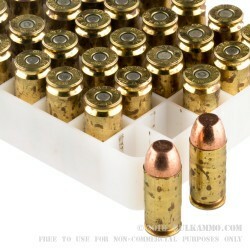 Well Speer hit this problem head-on with their Clean Fire TMJ ammunition. Taking a traditional brass case, Speer implements the use of the excellent non-corrosive CCI® primers and uses clean burning propellants. Rather than the traditional FMJ bullet which leaves the lead base exposed, the TMJ projectile is completely sealed to keep all lead captive. Speer has created an excellent dedicated indoor cartridge to clean up the indoor shooting environment, something which we can all be thankful for. 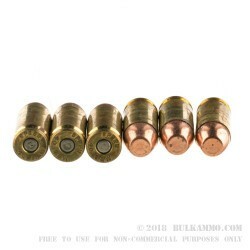 Take a look at their Clean Fire .40 S&W TMJ with a 180 grain projectile and buy up enough stock for the department! I've shot 100's of rounds thru my taurus 24/7 15 rd with no problems at all.